Every day I walk approximately 0.35 miles to and from work (double that when I go home for lunch). Although the distance isn't much, it's gotten a lot harder to do now that summer is almost here. I end up slightly sweaty each time I make the walk back and forth. This morning I packed my breakfast to take to the office since I was running late as usual. 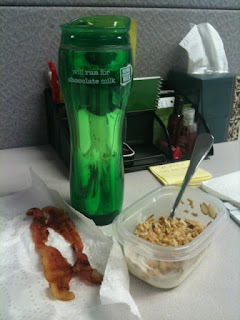 The thought of two crispy strips of bacon, just sitting in my bag, was almost too much to bare. I probably walked the fastest I ever have to the office just so I could sit down and enjoy my meal. Along with the bacon I had some non-fat vanilla yogurt with some granola (clearly not as exciting). I haven't even begun to drink my coffee yet ... it's days like this that I wish it was iced coffee in that cup. It's just going to get hotter!